Please let me put this myth to rest. Firstly, what makes a “qualified teacher”? Qualified Teacher Status is the certification given on completion of teacher training. It used to be the case that schools only appointed teachers who had QTS. Incidentally, this is not the case anymore (more about that later) but let’s just, for the sake of this argument, assume that all teachers in schools are properly “qualified”. What does that really mean? It means they have trained (and been assessed) to have the competence and knowledge to enable them to teach schoolchildren in a school. However, teacher training courses, with their lectures on pedagogy, and classroom management, and their in-school placements, bear no relation at all to home education. They are designed to train schoolteachers to teach schoolchildren, in schools – a very, VERY different scenario to home education. And they might be taught how to meaningfully feedback, to 30 learners at a time, whether or not they’ve been successful in that lesson (that’s marking books, because they can’t keep 30 children waiting, while they go round the class one by one, telling them). These are all essential skills for a school teacher; without them, the task would be impossible. But home educated children do not need teachers who are qualified in all these things, because none of these things are necessary in home education. You know your child and how they learn (or, if you don’t when you start out, you will soon). This means you can plan (or even allow your child to plan) how and what to learn, to suit your child and your family. You aren’t catering for a whole group of children. You are not tasked with filling 30 differently-wired brains with the same facts or skills. Instead, you can focus on your one child. And when they’ve learned something, you can tell if they have understood it and can apply it, without having to test them, and you can feed back instantly and in person. What’s more, you don’t have to “make them remember it”. 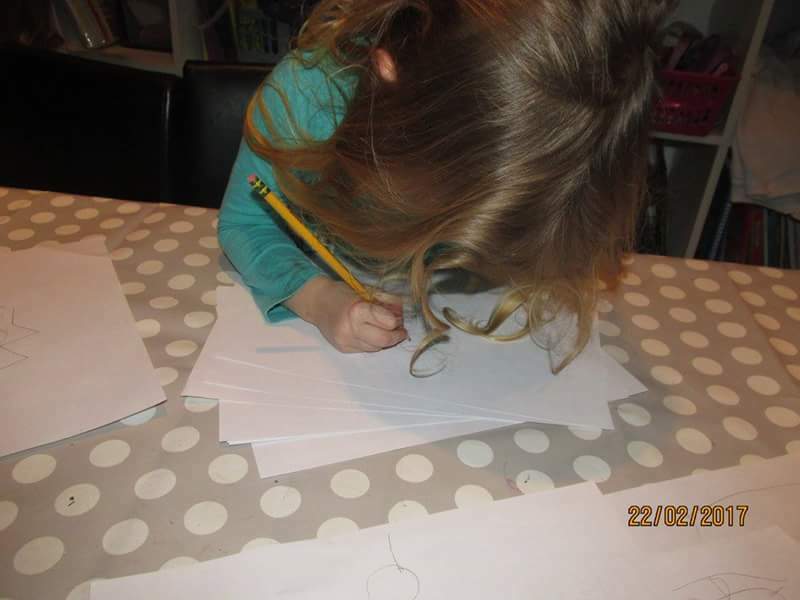 There is a growing movement among home educators, towards autonomous learning and unschooling. 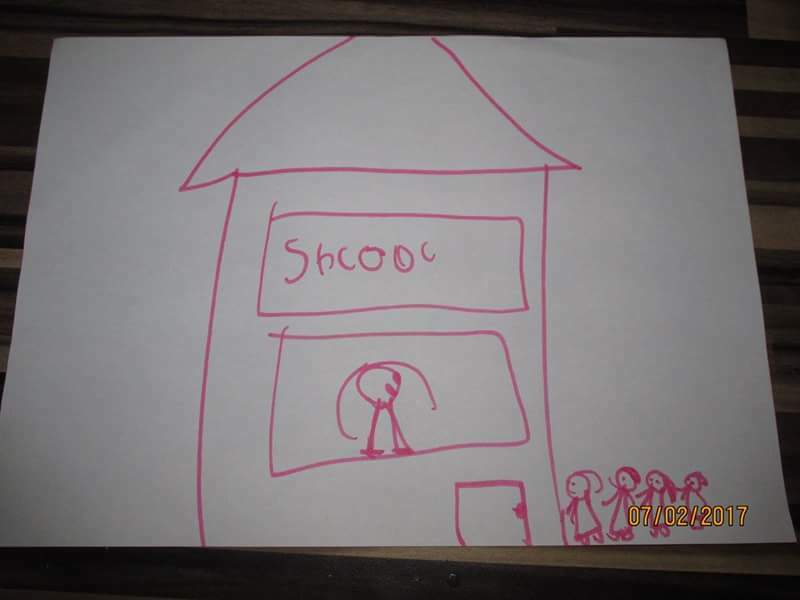 This is a way of learning in which the child themself determines what to learn and when, often without even realising they are doing so. If they want to learn it, or they see a need for it (including their own desire to take exams later on, if they choose) you won’t need to “make them remember it”; they will find ways to do this themselves. It still strikes me as a bit crazy that we try to force irrelevant facts into children’s heads against their will, and then try to come up with more and more ingenious ways to “make them remember it”. It kind of goes against human nature, doesn’t it? Being a qualified teacher is also not about being a subject-knowledge expert. School teachers are not, by any means, guaranteed experts in their subject. As a primary teacher, I have found myself teaching subjects I have not “studied” formally since I was in school. In teacher training, there is very little in the way of specific subject knowledge, especially if you take a postgraduate teaching qualification (1 year, often fully placement-based nowadays). Instead, we teachers have to learn the curriculum content for ourselves, before we go about our unit planning. We do not have a vast bank of knowledge in our heads of things like the Mayan civilisation, or the circulatory system, or how to multiply fractions. We learn it before we teach it, or we learn it alongside our students, just like home educating parents would. The library and the internet are both wonderful inventions. The subject knowledge is all out there, waiting to be discovered. Now, back to that point I mentioned earlier, about schools having (or not having) qualified teachers… As this recent article explains, schools are increasingly recruiting unqualified teachers. And even in my own experience, unqualified teaching assistants are often elevated to class teacher level, in light of teacher shortages (teaching assistants are invaluable, I’m sure any teacher would agree, but they have not undergone training in classroom management, teaching en masse, differentiation, assessment etc). And in many secondary schools, teachers now find themselves teaching subjects way beyond their specialism due to funding/timetabling constraints and certain subject specialist shortages. It’s becoming the norm now, to have unqualified school teachers teaching in schools. Despite my insistence that home educators don’t need qualified teachers, I do find it worrying that schools are increasingly appointing unqualified teachers; teacher training and qualification does equip teachers with essential class management strategies (as described above) without which, teaching and making judgments about whole classes of students, for whole programs of study, would be very difficult. So does the argument that all children need to be taught by qualified teachers, really stand up to scrutiny? Honestly? No. Children in schools, should definitely be taught by qualified school teachers; it’s a job that definitely requires a whole lot of training and competence. But for children learning at home or out in the real world, parents do the job perfectly. 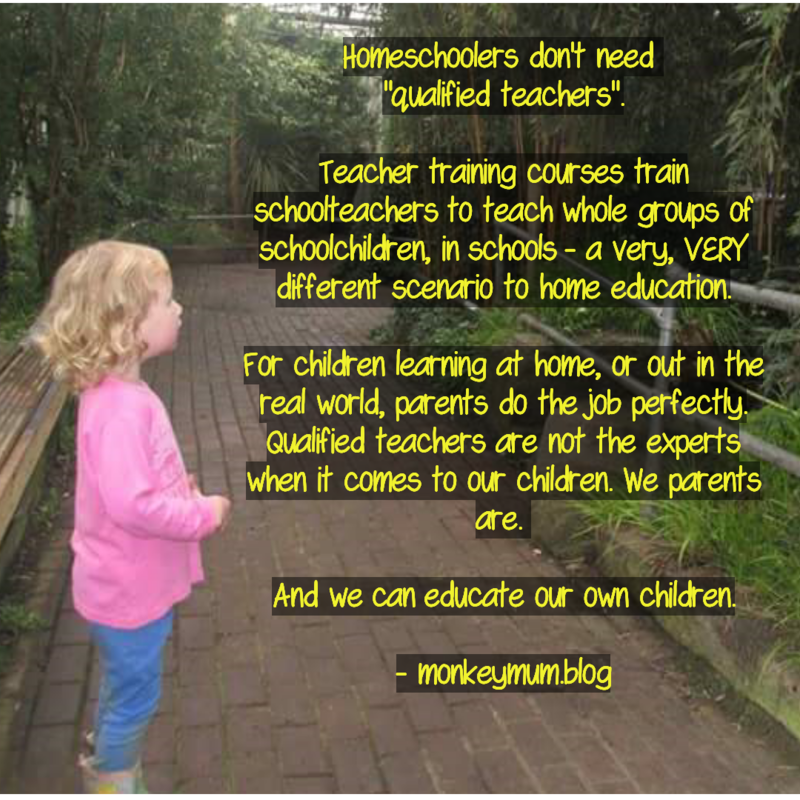 I am both a teacher and a home educator, but I do not use the same skills for both. The skills I use to support my own children’s learning, are the same skills that I’m pretty sure most parents would be able to learn or muster if it came to it. They are skills that are concerned with supporting and allowing our children to learn things as our family chooses. Qualified teachers are not the experts when it comes to our children: we parents are. And we can educate our own children.